Back in 2005, longtime childhood friends Andy Samberg, Jorma Taccone and Akiva Schaffer were all put on the map with their now-iconic Saturday Night Live short Lazy Sunday. They also came together with their first feature film, 2007's Hot Rod, which Schaffer directed and Samberg and Taccone starred in, but it didn't fare too well with fans and critics alike (like me). They each branched out and did their own things after leaving Saturday Night Live, but now they're back, setting their satirical sights on the music industry in Popstar: Never Stop Never Stopping, hitting theaters on June 3. While it can be a tad uneven at times, Popstar marks a hilarious return for the Lonely Island crew. In many ways, a movie like Popstar that turns the music industry on its ear is natural progression for the Lonely Island crew, whose "digital shorts" are often long-form music videos themselves. The entire trio wrote the script and star, with Schaffer and Taccone both taking on the directing duties. 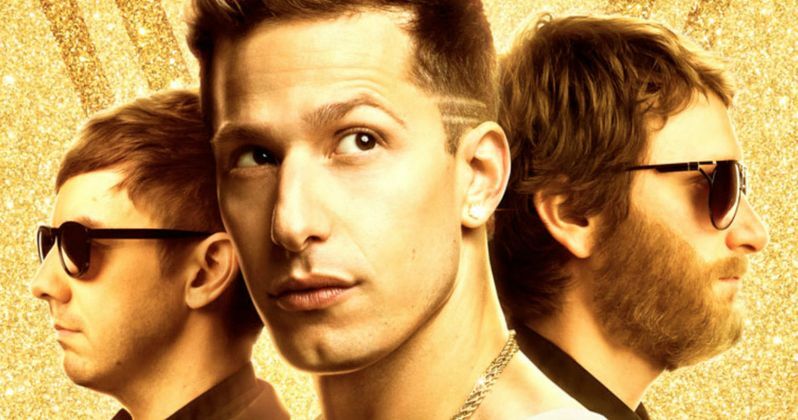 After cutting their teeth with SNL and various other projects, Lonely Island is in top form with Popstar, which follows a Bieber-like pop star dubbed Conner4Real (Andy Samberg). Unlike Biebs, though, Conner got his start as part of an iconic boy band known as the Style Boyz, alongside Owen (Jorma Taccone) and Lawrence (Akiva Schaffer), before Conner branched out on his own to become the biggest star in the world. However, Conner4Real's time in the limelight may be over. After a series of hilariously ill-fated decisions, Conner's new solo album flops, leading to Conner taking on a new act on tour, Hunter the Hungry (Chris Reed), whose star starts to exponentially rise as Conner's falls. Added into the mix is Owen, who now serves as Conner's DJ, his manager (Tim Meadows), girlfriend (Imogen Poots) and countless others in his entourage who are all just along for the ride. The movie is formatted much like a concert documentary, offering a behind-the-scenes glimpse at Conner's life, while also taking us to a "farm" to show how Lawrence's life turned out, far away from the music industry, after leaving the Style Boyz. Samberg has always had the chops when it comes to comedy and music, but he shows there's a lot more depth to his range than just tickling the funny bone. The insanely massive cast is bolstered even more by an absurd amount of (often) hilarious cameos from countless music icons, including a hologram of Maroon 5's Adam Levine, Snoop Dogg, Mariah Carey and oh so many more, most of whom are seen during interview segments where they reveal how Conner and the Style Boyz influenced their careers. Even with all of these huge names floating in and out of the movie, the real star is Lonely Island's writing. The story has a lot more heart than I was expecting, and it delivers side-splitting laughs on the regular, but it's really just impressive how they managed to craft a compelling story while cramming in a boat-load of original songs. Sure, it is a tad flat and uneven at times, but the pacing of the jokes and these insane musical numbers is so impressive that the miscues are replaced by side-splitting laughs soon thereafter. A few weeks ago, the Lonely Island already dropped one song used in the movie, Finest Girl (Bin Laden Song), but that's honestly just the tip of the iceberg. Every single song is just hilarious, but what's so brilliant about these guys is they sound like something that would actually be a massive hit... albeit with satirically asinine lyrics. There are 28 songs that will be released on the soundtrack, some of which weren't featured in the actual movie, which could make the soundtrack a big hit as well. It took this trio nine years to make another movie after Hot Rod, and I can only hope and pray we don't have to wait that long for the next, after the hilarious Popstar. In a summer that's rather light on comedy, Popstar should be more than enough for any discerning comedy and music fan alike.